My dining room is one of my favorite Christmas tree locales each year; because it faces the street and is the first room when you walk in the front door, it always holds a “special” tree. This tree concept was actually requested by Mama Nan – she wanted to see something with magnolia blossoms. Ultimately, this is what I came up with. I wanted to capitalize on all things southern and included lace and pearls along with the magnolia blossoms and gold magnolia leaves. Something you may not understand unless you see it for yourself is that At Home carries more trees in more varieties than I’ve ever actually seen in real life. When Dave and I were zig-zagging through the what-looked-to-be-Christmas-tree-lots in-store, I kept finding myself off-task, considering pink flocked pretties, rainbow varieties, and colors that wouldn’t have fit it my house but was convinced I should bring home anyway. This tree was more traditional than a lot but it took my breath away just a little bit – it has 3,500 tiny, firefly-esque lights covering its 7.5′ frame. Stunning. It truly looks like it’s covered in lightning bugs. Instead of sprinkling the magnolia floral clamps throughout, I concentrated them all at the top of the tree, along with the gold leaf stems. As I brought them down the tree, I got a little more spaced out… like a gradual trickle. 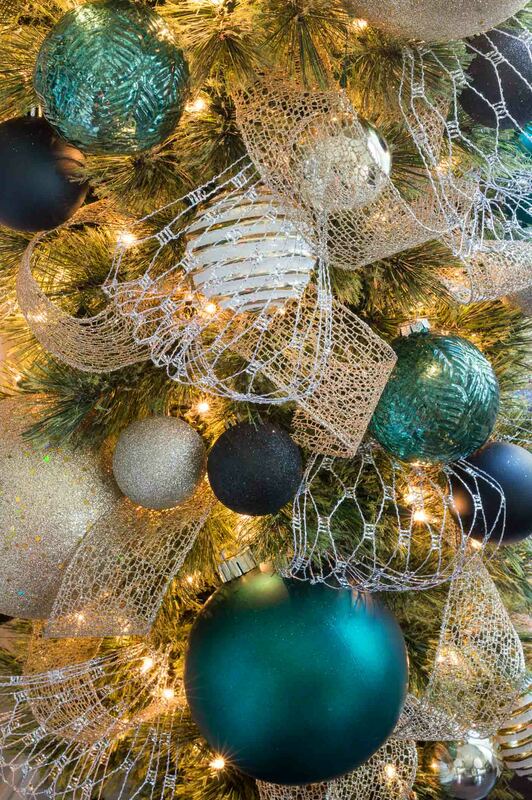 To see the methods I use to incorporate ribbon, see my tree decorating tutorial post HERE. I mixed in white, sheer gold, lace, and even a dash of blue – most in 2.5″ widths. Our kitchen and living room have undergone major changes this year and I can’t wait to see what the new spaces look like in their seasonal glory. I’ve never had a pencil tree but after I found THIS ONE, I’m upset that I’ve never used them before… and, that I only came home with one. On the spot, I knew I wanted to bring it home to set up in this corner of our breakfast nook. When I finished, I was tempted to start moving it all around – or, to head back to the store to get a few more. I loved that it literally took an hour (maybe less?) 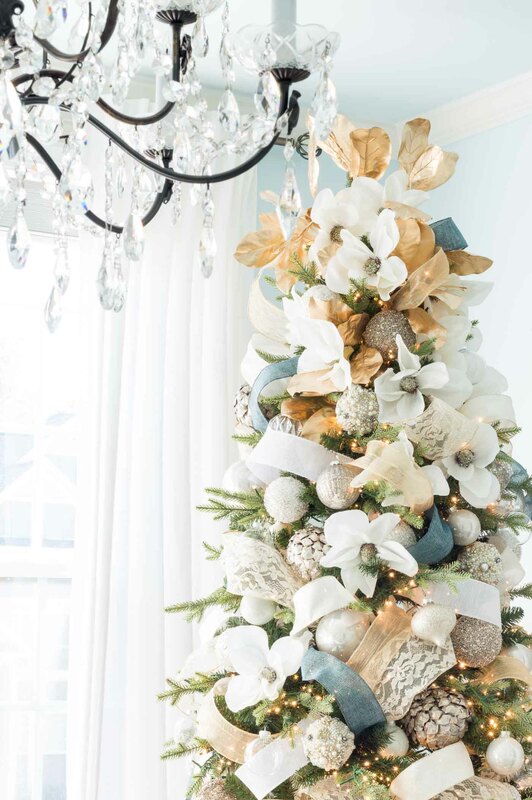 from opening the box to fluffing to finishing the entire tree, and I loved that while it still offers a festive punch, it’s narrow enough to fit in almost any space, in any room. It’s also dense enough where you can get away with less filler and there is little to no work involved in straightening the branches. In the four years we’ve been in this house, and in all the trees I’ve concepted and decorated, I’ve never created one with greens. Because I’m still enjoying our new vibe in the open concept living areas, I didn’t want to go too far off base. So, I stuck with a color palette that felt natural with what we already have, while still keeping it Kelley Nan-like with just a touch of Christmas gaudiness 😉 All of these ornaments and embellishments were from the At Home Christmas aisle, including my new obsession- that wire mesh ribbon that can be bloused out in tufts. Note: Dave wanted to call this tree something like “Mr. Pencil” and was disappointed in my un-creative title haha. I couldn’t resist the third tree I came home with; as soon as I saw it, I envisioned outfitting it in all white. 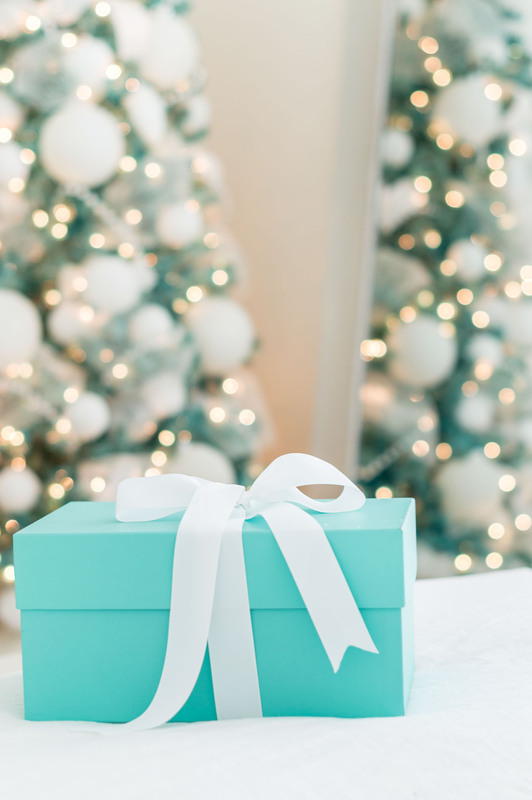 I basically wanted the Christmas tree version of a pretty Tiffany’s box, wrapped in white. 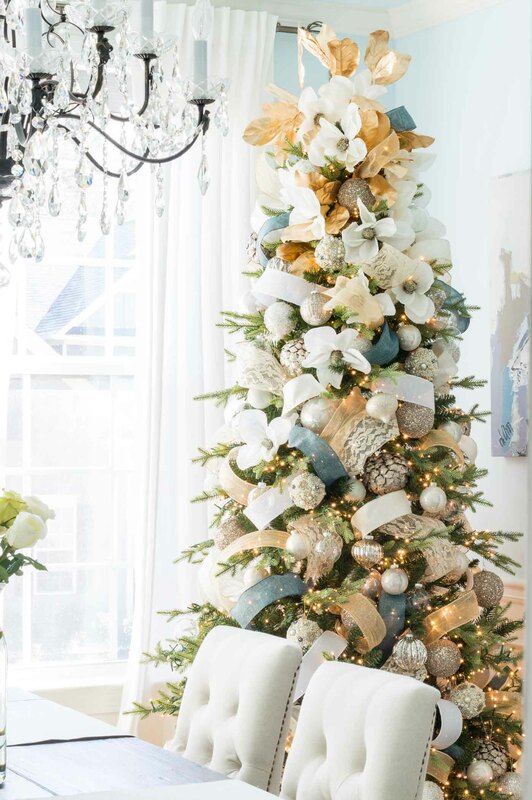 THIS 7′ tree is also under $100 so if you find yourself just having to have some trees in colors that may not coordinate with your main living areas, I say go for it and set them up in a secondary space like a bedroom. It’s easier to add a pillow/throw to the bed to tie in the tree than working around decor in multiple rooms and trying to make it work. 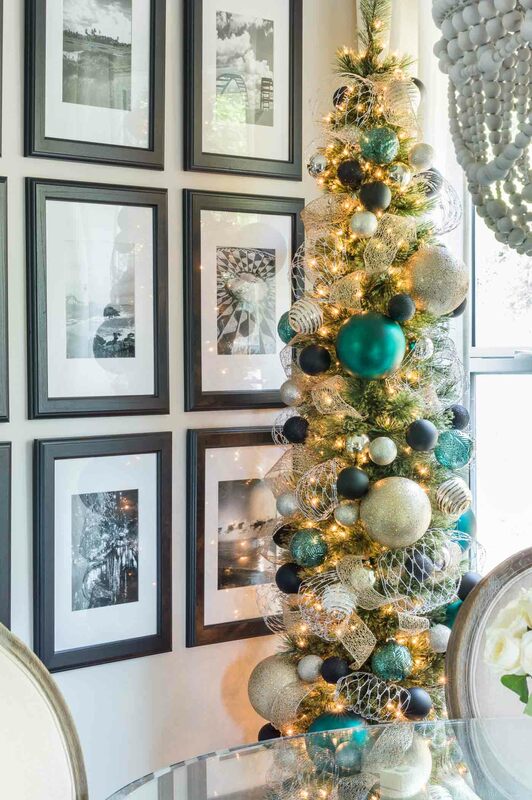 My friend Kris of Driven by Decor actually stayed in this guest bedroom after this tree was set up; as much as I love having a tree in our master bedroom, I was so happy for her to be able to have one in her own room during her stay. 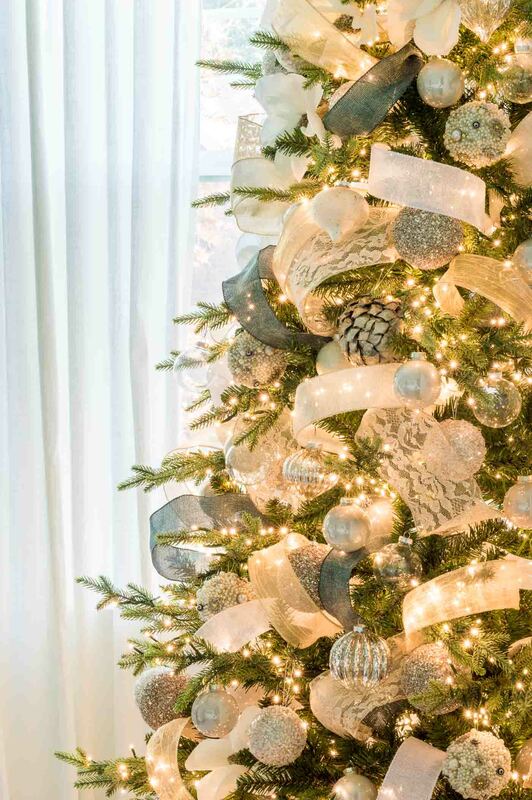 I’ll be sharing a round-up of all the trees I’ve created in a few days and will be sharing a full Christmas home tour the week following Thanksgiving. If you’re looking for more ideas right now, visit the two new tabs at the top of the page, and be sure to subscribe to receive emails at the bottom of this post. Lastly, if you’re working to get ahead a little bit before Thanksgiving week, most items in the gift guide I launched with 10 original gifts (HERE) are now on sale for the weekend. 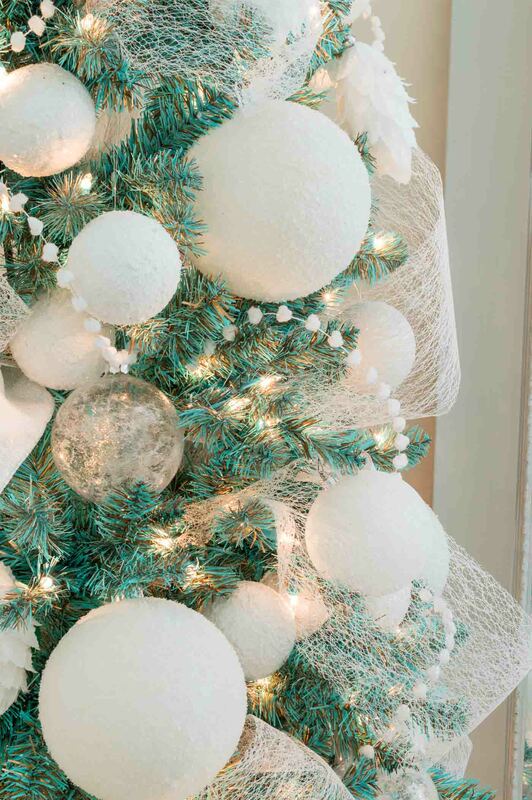 Have a new Christmas tree theme you’re looking to try this year? Let me know in the comment section below! You’re the queen of Christmas trees!! 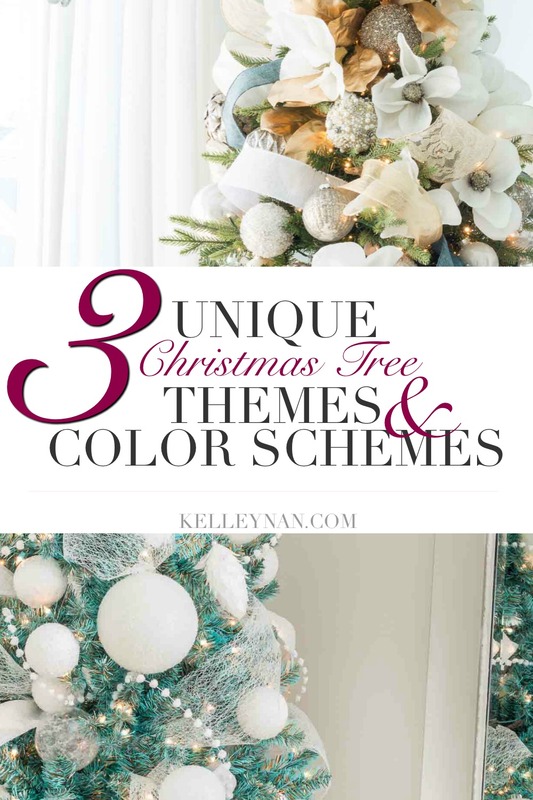 Kelley these are all so beautiful and creative and I LOVED having that gorgeous tree in my room – the biggest treat! Hoping that At Home gets some stores near me soon!! I have so been looking forward to your reveal! And you did not disappoint!! You are incredibly talented and I love the colour choices you’ve made this year! They look amazing and i can’t imagine the work they took. Absolutely beautiful job! Gorgeous Kelley! I love them all, but the magnolia one is my fave 💕. You outdid yourself once again! Another amazing Christmas at the Lopez home! Love all your creative designs. I can’t wait to see the complete revel on Friday! Hugs!!! LeAnn, I used the same colors on our main living room tree! I adore each of your unique trees, but your dining room tree took my breath away. Thank you, as always, for your beautiful inspirations! Oh, Sharon, so incredibly sweet of you to say! I hope your tree is up and that you’re enjoying it! 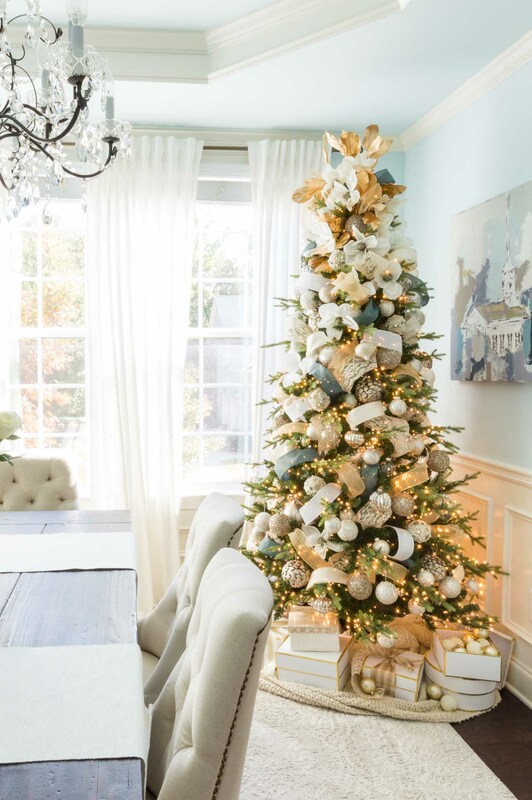 Kelley your trees are always so pretty, and the Magnolia theme is pure southern perfection! Way to go Mama Nan, great suggestion! Jen, I wanna see how many you have this year! Kelley, that magnolia tree is just gorgeous ! I love the firefly lights and the way they sparkle and pinned the ribbon tutorial on Pinterest . Beautiful job ! You really are in the spirit! Your trees are beautiful but your dining room tree is special. I love that you decorated it with your mom in mind. From the lace to the magnolias and everything in between, it is beautifully elegant! Cheryl, thank you! I wish I had the time- I’ve gotten questions over the last couple of years but don’t have the time to spare. How fun would that be?! These are all so gorgeous!!!! 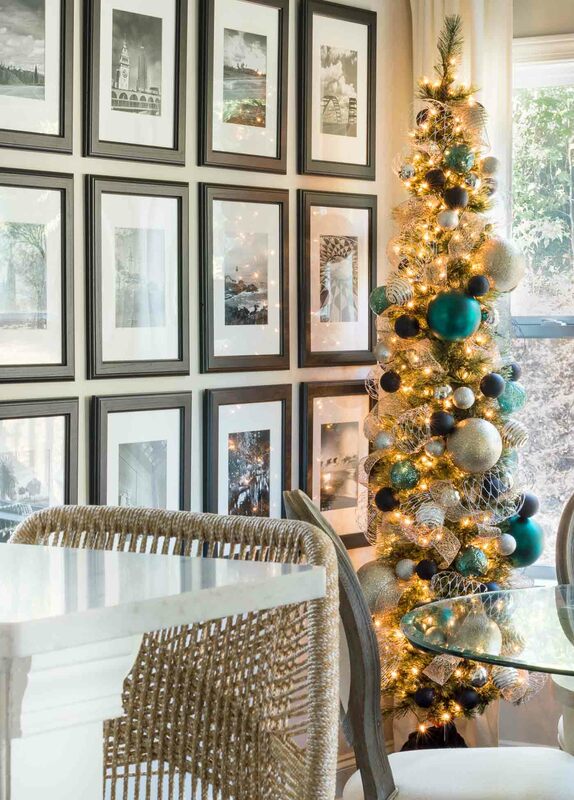 I LOVE pencil trees and have 3 that I decorate all completely differently. I love that they can literally go anywhere and are so easy to assemble and decorate. Olivia, yeah for a fellow pencil tree fan!! I want another! 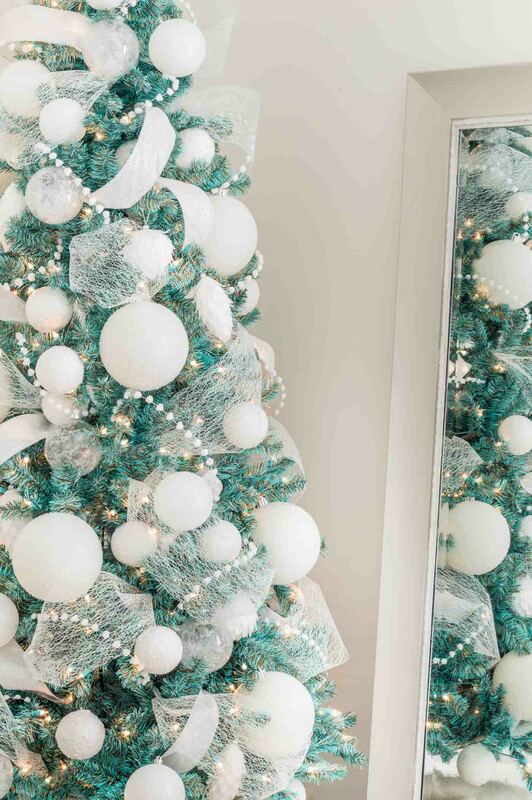 You truly are the queen of Christmas trees! My word – they are all so stunning. I spotted the Southern Grace tree on Instagram and had to pop over for a closer look. All the details! Gorgeous! Chelsea, you are too kind! Merry Christmas!! I love how you pull off bling and sparkles in such a sophisticated way. 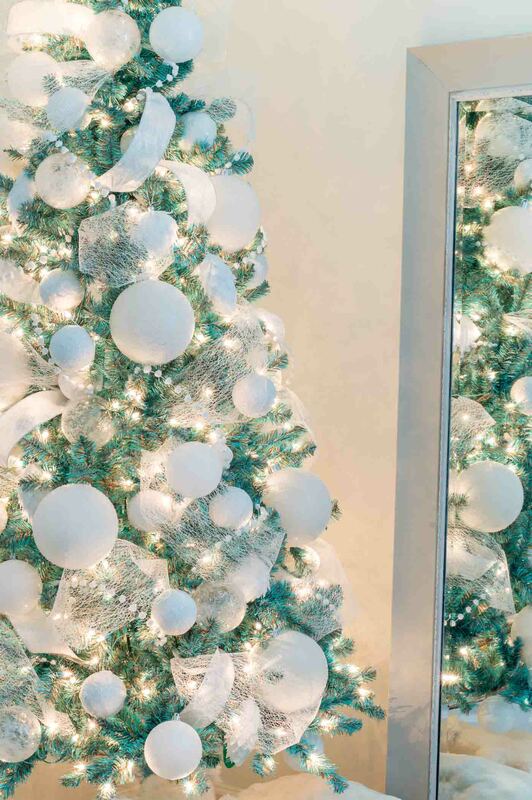 Each tree is beautiful but I am in awe of the Tiffany blue. Best wishes for a wonderful Thanksgiving. All your recipes look scrumptious!! They are all so pretty, it is hard to choose a favorite! I love how each one is so different from the rest. The pics are beautiful, but the trees in person are divine! Nan, you are the best 😉 Here’s to some new themes and brainstorming next year! Every year I try to recreate your ribbon work, but my tree I think is too sparse. I was thinking of buying the main one with the firefly lights you linked in this post. Is it nice and full? Are you happy with it? Hi, Jenn! It is full and I am happy with it. 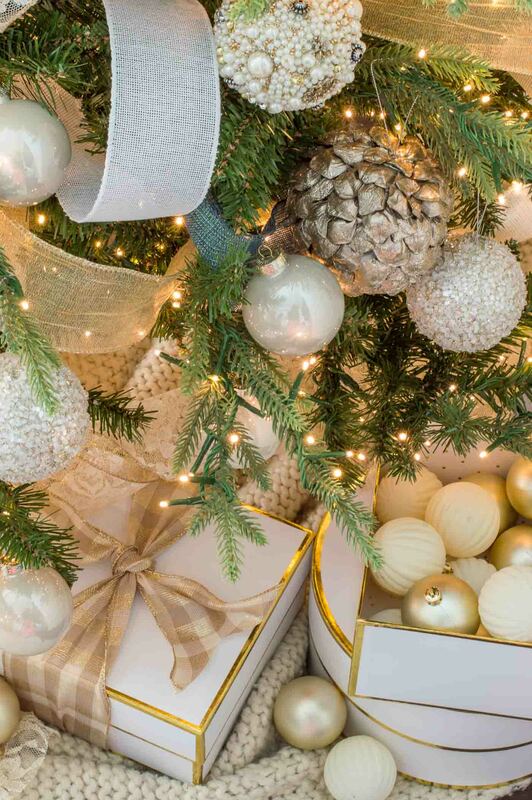 For your more sparse trees, I would look for larger ornaments and wider ribbon- I hopt that helps! My mom used this idea for her Christmas tree this year and it was the most gorgeous tree that she has ever decorated. If I hadn’t had knee surgery and already had mine up I would use this idea. Next we both are going to use this idea. It was much easier and looked more elegant. Thank you for your wonderful idea. your are a superb at tree decorating. Jacquelyn, I am so sorry to hear that! Enjoy what’s around you – even if it’s just a few twinkle lights – and look forward to more next year. I hope you heal quickly! I just found your site and started placing my ribbon the way you do it in your tutorial! My tree looks amazing!!! I’ve looked at tons of tutorials but none come close to yours! You are incredibly talented! Your trees are second to none! Sooo glad I found you!